Hot off the press this morning, the Telegraph reports that according to a new and unnamed paper in the journal Current Biology, half of world’s museum specimens are wrongly labelled. Now, I could dig out the original paper to see what the Oxford University and Royal Botanic Gardens colleagues actually said. I’m sure the estimations are vague and the researchers are ballparking the issue. I’m sure they didn’t conflate specimen labels with display labels as the Telegraph has. However, that headline is already out leading scores of people to throw their museum merchandise into the skip shaking their head “I trusted you museums, I trusted you”. So what’s needed isn’t clarification or explanation. What we need is excuses. STAT. Here are some off the shelf excuses for museum professionals who may be facing some tough questions this morning*. It’s the bloody botanists. The reported story is all about ginger and potatoes. It’s the botanists. They are letting the side down. It’s the bloody entomologists. Well over half of all natural history specimens are insects. So whichever way you look at it, entomologists are letting the side down. It’s the hippies. Bizarrely, the coverage claims that more than 50 percent of the world’s natural history specimens have been discovered since 1969. Firstly, I’m not even sure what that means. Is a specimen discovered when it is collected? In any case, it’s all those hippies in the 60s that messed things up. They are letting the side down. It’s the dyslexics. 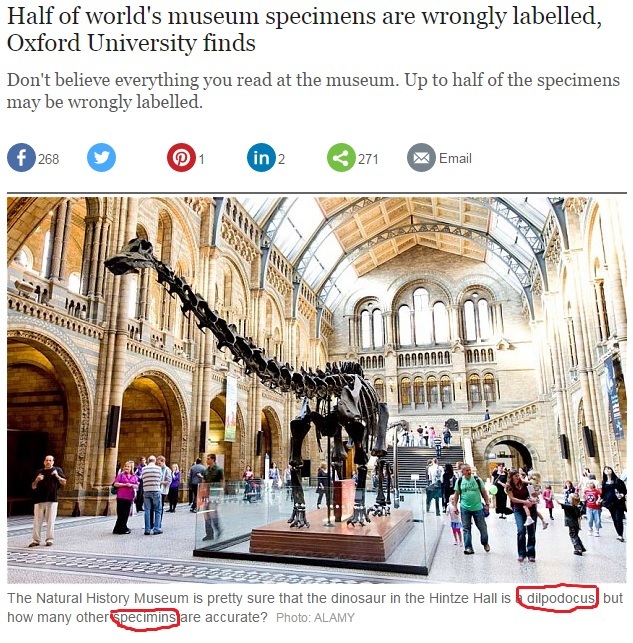 Unfortunately, for the Telegraph, in an article about specimens being mislabelled they’ve managed to incorrectly spell both Diplodocus and specimens. Even whilst making a joke about how the Natural History Museum is pretty sure that the dinosaur in Hintze Hall is dilpodocus (no italics, no capital). Yeah, it’s a dilpodocus, dilpy for short. Do spelling mistakes count? If they do then it’s the dyslexics, the dyslexics and human error are letting the side down. It’s the loss of subject specialist knowledge in a hard hit museum sector where we are losing expertise year on year. Best not mention this though. It’s depressing. It’s the bloody art historians and archaeologists. The headline doesn’t mention natural history museums so it’s probably the bloody art historians mislabelling paintings. Well there’s only a couple of hundred thousand of those, so it’s probably the bloody archaeologists too not labelling their pot fragments correctly. Art historians and archaeologists are letting the side down. There we go folks. If you’ve got any excuses to help out colleagues in our time of need, why don’t you leave them in the comments. Together we can weather this ‘scandal’. UPDATE: 17/11/2015 Corrected for many, many doubly ironic typos for writing this up in haste.